Figure 1: The end result of this step-by-step article. A basic conceptual understanding of what flexfields are is necessary in order to understand what follows. There is a very good 2-3 page explanation in the chapter "Flexfields" of the Oracle Application Developer's Guide. 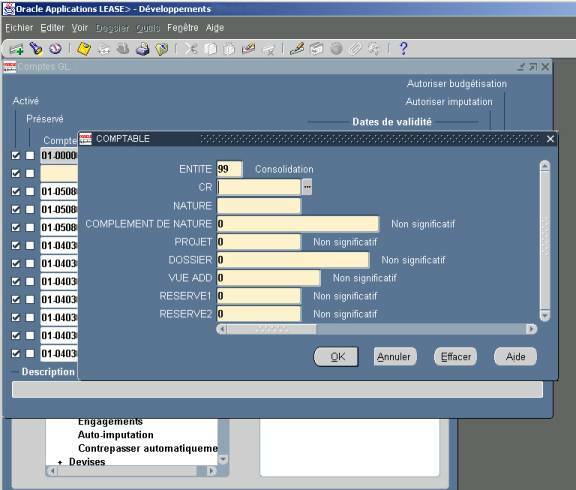 Now we want to create a non-database text item that will display the concatenated values of the segments of the accounting field. 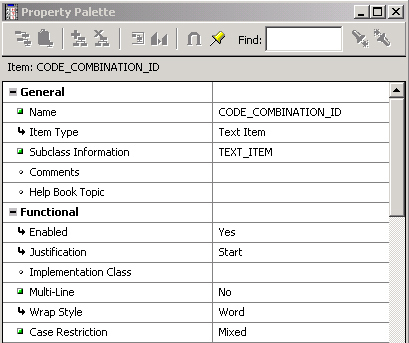 This item should use the TEXT_ITEM property class and be assigned to the appropriate canvas where you want users to see it. 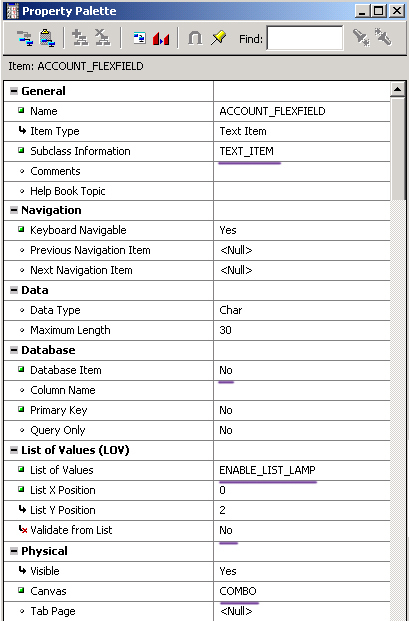 You then need to assign to it the dummy LOV 'ENABLE_LIST_LAMP' which comes from the Oracle Application template. Make sure that property 'Validate from list' is set to No. This ensures that the List lamp works properly for your flexfield. Figure 3 shows an example of such displayed field. We only show the most relevant item properties. If you are updating someone else's form, you may need to check that no block or item triggers are overriding your form level triggers. Check also the execution style of your form level triggers. Whether your trigger should fire in mode Before, After or Override will depend on your context. --the concatenated field on execute query). -- the concatenated flex field, it is not taken into account. Et voil� With only these 5 steps you can achieve the result illustrated in figure 1. What we have shown only scratches the surface of what can be done with Oracle Application flexfields but it provides an easy-to-follow introduction. Hervé Deschamps is a Technical Manager with Oracle Corporation. Over the years he has developed a number of applications using Oracle Development Tools and others. He has an extensive experience of all phases of the development life cycle. He is also known in the technical community for his article publications centered around best custom development practices and for his user group presentations. You can reach him by e-mail at . He also maintains a web site full of articles, scripts, tips and techniques at http://www.iherve.com. Permalink Submitted by Avirup Nag (not verified) on Thu, 2005-09-29 08:27. Really helpful and good and saves a lot of time. Hope every apps techies will be benefited. Permalink Submitted by M.H. Sayeed Ahamed (not verified) on Tue, 2006-08-22 23:59. My humble request to the author to put more articles relating to technical as well as functional aspects in oracle apps 11i - like RICE Components with examples. Permalink Submitted by lykmyk on Thu, 2007-03-08 09:16. Thanks for the contribution. It was definitely very helpful. I was able to accomplish this task quite easily. The only issue i have though, is that i get a foreign key violation error when i try to save the new record which includes the dynamically created key.